I will be completely honest…I have NO experience with Eastern European food. I probably should considering my heritage…but this was my first go at it, and I was pleasantly surprised!!! The ONLY downside to this recipe is that it takes about 2.5 hrs from start to finish. Thankfully last night was weird…so we were ok with eating dinner at 8:30. I made very few modifications to the original recipe from “CrankingKitchen” The biggest adjustment below is that I will be doubling the mushroom recipe since we couldn’t get enough of them! 1. Bring a large pot of water to boil. Add the cabbage head and remove the leaves to a bowl or strainer as they come off the head, about a few minutes for each. Aim for about 12 leaves. When you get to the center and the leaves are small, just take the head out, let cool and chop. Lay in the bottom of a casserole pan. 2. As the cabbage is boiling, heat butter in a large skillet over medium heat. Add the onions and celery and cook, stirring occasionally, for 15 minutes. Add to a bowl and let cool for a few minutes. 3. Preheat the oven to 300 degrees. Add the beef, pork, and egg to the vegetables, along with salt and pepper, and mix well. 4. Lay each cabbage leaf out on a work surface (shake out any remaining water) and place about 1/3 cup of meat mixture (it’ll vary depending on the size of the leaf) at the base of the leaf. Roll up a little bit, then fold in the sides and continue to roll. Like a mini Polish burrito. Burrito-ski. Place each pigeon tightly in the baking dish, seam side down. 5. Place, uncovered, in the middle of the oven and bake for 2 hours, basting with the pan juices every 30 minutes. 1. In a skillet, heat 2 tablespoons butter over high heat. When the foaming has just died down, add the mushrooms. Stir frequently. First they will absorb the butter, then they’ll release their liquid, then soak it back up again. 2. Add the garlic, stir frequently for about 30 seconds – 1 minute, then turn the heat down to medium. Add the broth and drippings and cook, stirring occasionally until the sauce has reduced. Season to taste. 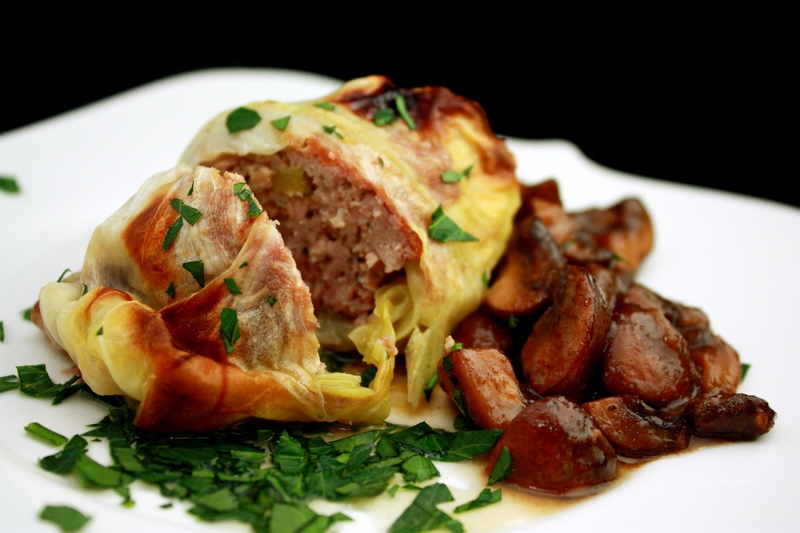 This entry was posted in Main Dish and tagged beef, cabbage, cabbage rolls, dinner, eastern european, food, grass fed beef, ground pork, homemade, mushrooms, Polish, real food, yum. Bookmark the permalink.